Hey guys! So after following the Chalkboard Method by the amazing gals at Being Boss (definitely recommend it! ), I realised that one thing I didn't do enough on this blog is actually talking about what I do and how I do it. So I put together a little list of topics that you might be interested in and if you're a newbie in the creative world, then these posts will be perfect for you. Today I'd like to share with you my favourite sites when it comes to finding inspiration and developing moodboards for various projects. I didn't include Pinterest in this list because I felt it was pretty obvious and it's also not made exclusively for design inspiration. I have to say, if you don't know Behance, then shame on you. But we all need to start somewhere and this one is a really good start. Behance is a platform where creatives share their projects and designs in the form of a portfolio. So you can create your profile and add projects as and when. The great thing about it, is that you can literally see everything that everyone has been sharing and it's the perfect source of inspiration if you're stuck with a brief or in need of examples for your moodboards. I find the search tool very helpful when I'm searching something quite specific. I'm on Behance actually, so feel free to have a look at my profile right here. Yep, pretty good isn't it? 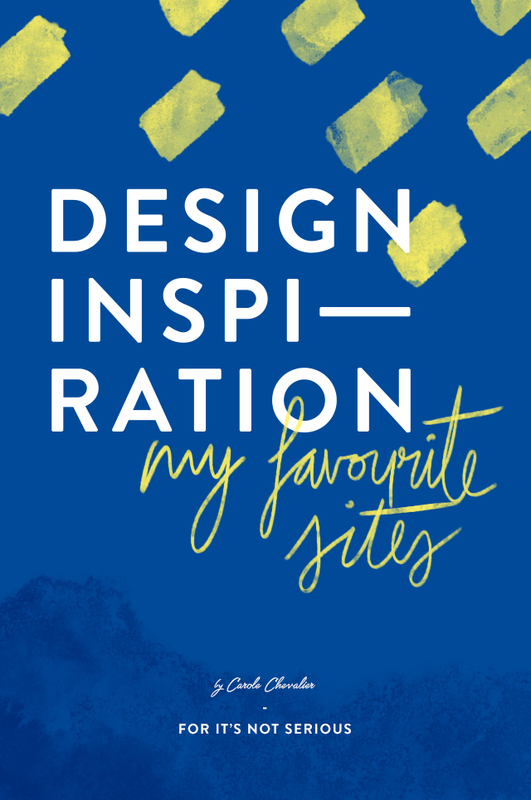 It's close to Pinterest in the layout, and it's full of design related inspiration. I quite like sometimes to not search for anything specific and just scroll down to see a good mix of visuals that might spark an idea in my little brain. It's also great for logotypes and typography. Oh and talking about search tools, they actually have one where you can select the colour you're after. So cool. I discovered this one thanks to Jason a while back now, and the website has been through quite a few changes, but it's always been great for inspiration and I love the categories that they organise the visuals into. They now have handy resources that you can purchase and you can submit your artworks to be featured in their next articles! This one is orientated towards branding and packaging and I love it. Richard Braid, who's behind the whole website, gives a real insight in the designs he's sharing and I always find his opinion really valuable. Plus, rather than seeing just one image of the project featured, you always see multiple examples, which is really important to me. If I see a new brand design I find interesting, I like to see the collaterals to have a good idea of how the whole brand was produced. This is Mr Cup design's blog and every time I need to look for luxurious stationery and intricate illustrations, I immediately have a look at it. It's pretty much eye candy all the way for any designer out there. A designer himself, Fabien has put together a letterpress calendar for the past couple of years and I'm always drooling over it. Also, the 'Excellence' section (in the Topics menu) is one of my favourites. On the rare occasion that I have to work on some web design, this is my go to website. I only wish they would update it more often! The filter system is great and I always find loads of inspiration. However, I also found this one very recently called The Best Designs and it really helped me with one of my projects. Again, easy to use and very practical! I guess this one is a bit like Behance, who doesn't know it? But it's a great source of inspiration so I had to add it! I seem to be checking it more often when I'm working on branding but then again, I find it great for illustrations too. I know you only see a snippet but sometimes that's just enough. The whole website is made as a community of designers that are sharing their work. If you sign up, you can also appear in the list of designers to hire. Handy! Very different, but oh so inspiring! Danielle's blog brings me back to my source: art. I started my journey into design as an art student and sometimes I do miss it a bit. But it's not just great for finding amazingly talented artists. I find that inspiration should come from various sources and when I venture on The Jealous Curator, I get a break from the typical design inspiration I'm usually looking for and it's a bit like I'm escaping and letting my imagination wander as I scroll down the blog. I hope you found this list really helpful and keep you eyes peeled for the next posts!